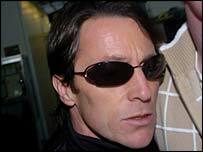 Champion jockey Kieren Fallon has been suspended from racing for 21 days for "non-wilful" breach of riding rules. Fallon was found to have broken the rules regarding riding out a horse to the finish at Lingfield last week. Jockey Club officials have said they will hold a separate investigation into claims of race-fixing made by a newspaper against Fallon. Fallon claimed he made a mistake by slowing down too soon at the end of the race but denies the fixing allegations. His ban, which is the maximum for the offence, is due to start on Tuesday 16 March and run until Thursday 8 April on days on which flat racing is scheduled to take place. The jockey returned from Spain on Monday afternoon, having opted not to ride in Malaga on Sunday. And he was at the centre of a media scrum when his plane landed at Stansted Airport. Wearing dark glasses and a black bomber jacket, the 39-year-old made a dash for the exit with a male friend. They rushed past photographers and reporters and raced down an escalator. The pair left in a silver Mercedes, without making comment. Fallon's lawyer Christopher Stewart-Moore said: "We have now made formal admission of a breach and it is called non-wilful breach of rule 156, which I think is not riding a horse out to the finish line. "I have given him my advice, he has taken my advice and he is agreeing to 21 days' suspension. "He is in the country and he sounded well and he is ready to deal with the Jockey Club inquiry." The Jockey Club had stressed before Monday's announcement that its initial meeting would focus solely on the riding offence at Lingfield. The race-fixing allegations, made by the News of the World, also focus on Fallon's riding at Lingfield, where his mount Ballinger Ridge was second. Fallon insisted he had made a mistake by slowing down too soon at the end of the race and losing to Rye, the 8-11 favourite.. But the paper claims he had earlier tipped the winner to its reporters. Because of what were described as irregular betting patterns, the stewards did not automatically impose the ban as usually happens in such cases and referred the matter to the Jockey Club for further investigation. Jockey Club spokesman John Maxse said that it would consider the newspaper claims alongside other evidence later in the week. "The News of the World have agreed to provide the Jockey Club with the dossier of their own investigation into Kieren Fallon and once we have studied it we will be interviewing the jockey about its contents," said Maxse. But he dismissed Monday newspaper claims that the Jockey Club is currently investigating a widespread "betting scam" among jockeys. "The claim that 14 jockeys are currently the subject of a 'betting scam probe' by the Jockey Club is wholly inaccurate," said Maxse. "Such allegations are without evidence and unfairly undermine public confidence in racing." In a statement issued through his solicitor, Fallon, who has denied any wrongdoing, said that the way in which he rode the horse was in no way influenced by the information he had imparted. Ballinger Ridge's trainer, Andrew Balding, said he was "slightly shocked and surprised" by the newspaper's claims. But he added: "Having watched the race countless times, I still firmly believe it was an error of judgement by Kieren. "I can safely say that both myself and the owner wanted the horse to win badly and we have another chance to put things right on Tuesday." Martin Dwyer will be in the saddle when the five-year-old runs again at Lingfield on Tuesday. "The only reason Kieren rode was that Martin was in India, but he is back now and will take over," said Balding. "Fallon had clearly stopped riding"